Carlos Cruz-Diez is a historic protagonist of the kinetic and optical art movements. In October 2016 he dialogued with the architecture of Auguste Perret (“Un être flottant,” Palais d’Iéna, Paris) via monumental environments made especially for the site or adapted to it. This exhibition at Galerie Mitterrand, also curated by Matthieu Poirier, is the retrospective counterpoint to that event, featuring over thirty key works by this artist born in Caracas in 1923. These paintings, reliefs and environments made between the 1950s and the present demonstrate the constant exploration of colour as a spatial and sensorial phenomenon by this artist now aged 93 – the investigation of colour as that “floating creature” dreamed of by Wassily Kandinsky. Trained at the fine arts school in Caracas, where he obtained his professorial diploma in 1945, Cruz-Diez spent the 1950s between Caracas, Barcelona and Paris, eventually settling in the French capital. It was in 1954 that his work took on abstract turn, and when the artist began his constant challenging of the support’s sensorial passivity. His Proyectos murales (1954), abstract reliefs in the tradition of Sophie Tauber-Arp’s Neoplasticism, were painted in primary colours and stood out from their immaculate support as a result of the ambient light and its variations. Equally surprising is the fact that the salient elements of these reliefs could be freely handled by viewers. In 1955 the intertwining structures of the Parénquimas series had elements of both Informel art and cellular microscopy. In 1956 this play of meshes took a more geometrical turn and the surface of the painting, covered with elongated triangles painted in violently clashing primary colours, producing powerful effects of visual instability. These works also prefigure the system of vertical, parallel lines that continues to obtain in the artist’s most recent pieces. For Cruz-Diez, the fixity of the composition, even when abstract, is simply one more image, a new iconography, as symbolical and narrative, and even anecdotal, as figurative art. As of 1958 the artist saw a way out of this impasse in the colour theories formulated by Ogden Rood and Eugène Chevreul in the 19th century and applied in the Neo-Impressionism of Georges Seurat, the Analytical Cubism of Pablo Picasso and Georges Braque, the Futurism of Giacomo Balla and the Suprematism of Kazimir Malevich, from which movements he took his own use of vibration, acceleration and suspension. He is just as fascinated by the most recent scientific discoveries, with modern graphics, photography and reprography on one side, and optics, cognitive psychology and the phenomenology of perception on the other. For Cruz-Diez, the work of art must be “kinetic” and “dynamogenic”: in other words, the visual element, if not necessarily mobile itself, must elicit movement – a motor reaction – in the beholder. Also, and above all, it must produce the “atmospheric” sensation of an impalpable phenomenon, that of a pure colour floating in physical space and, especially, between the eye and the brain, in the psycho-physiological field of perception. In the 1960s and 70s, this aesthetic orientation acquired a political or, we might say, democratic connotation in the artist’s work, in that it challenged the artistic hierarchy for which the artwork (or its creator) is seen as more important than the beholder. 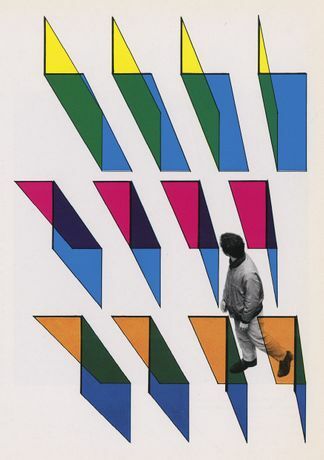 His idea of active participation, that is, of involving a volitional body that is not just subjected to a message, even a symbolic one, is explored in various ways in Cruz-Diez’s series, not in accordance with themes or subjects, but following various colour-related phenomena, processes or methods (as of the late 1950s, the prefix chromo- began to be included almost systematically in his titles). This exhibition sets out to convey the different facets of the artist’s world as fully as possible, with pictures (Couleurs additives, from 1959 and Inductions chromatiques from 1963) that are painted, silkscreened or, in recent years, printed from electronic files. Cruz-Diez employs the inventive potential of technology in order to achieve what one could describe as a “surgical” formal precision, the aim being to constantly improve the work’s sensorial effectiveness. These elements also concern his reliefs (the Physichromies, from 1959). Most of these do not actually consist of a three-dimensional form projecting from a ground but an entire plane divided into a multiplicity of fine vertical partitions, themselves constituted by strips made from various materials (cardboard, Plexiglas, metal, etc.) and held perpendicular to the vertical support. Today, the powerful computer industry likes to see the kinetic, optical, perceptual and participatory art of people like Cruz-Diez as the forerunner of digital or interactive art. And yet the authentic, direct – as opposed to mediated – experience of his work tells us the opposite: the viewer is not a pair of eyes on a stick facing a painting, but a mobile body, experiencing in vivo a work whose sensorial reality has a distinct form for each individual. Now a crucial part of the creative process (the work, says the artist, “does not exist without the viewer”), this beholder at the same time has the experience of the watcher watched, as well as enjoying a kind of aesthetic pleasure that the artist has always sought to make equivalent to the one provided by music. It would be a mistake to see the work of Cruz-Diez as simply a clever and playful exploration of colour, for what we have here is nothing less than a revolution of the gaze, a dynamic experience of the elasticity of our perception, when colour is no longer petrified, facing us, but hovers over its support, on the edge of our vision.